The Germination Station is the perfect indoor start to your garden! 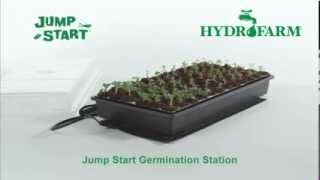 The Jump Start Germination Station is an ideal way for the space-challenged gardener to start seeds indoors all year round. In this kit, the Germination Station comes complete with a 72-cell seedling insert, watertight base tray, 2" vented dome, and a 17W heat mat. The vented dome helps to maintain just the right amount of humidity to ensure germination success and bigger, healthier seed starts. The compact size of the station allows anyone with a spare corner to start a garden. Add your own choice of growing media and plugs to get growing.